Bass trap All in One! It's a Diffusor! Diffuses mid–to–high frequencies, proved to minimize flat–surface reflection problems by broadly and evenly scattering sound energy. 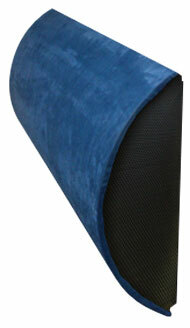 It can include a built–in Mass–Loaded Vinyl (MLV) membrane low–bass trap for corners. 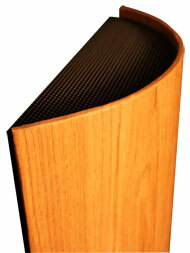 A graceful conical tapered cylindrical diffusor specifically designed to improve speaker imaging in audiophile and home theater systems, plus enhance the sound of voices in conference and meeting rooms, voice-over booths and recording studios - many different designer cloth options, or even wood veneer - plus backlight it with remote control color changing LEDs! The Advanced Diffusors / Absorbers simplify the creation of natural-sounding professionally–accurate acoustic spaces. 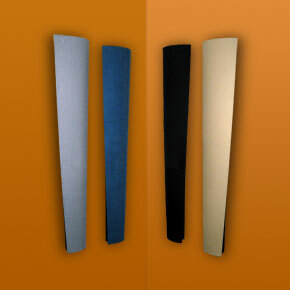 The core of the system is an innovative Diffusor, an improved version of the classic used in studios since the 1930s. These have proved to minimize flat–surface reflection problems by broadly and evenly scattering sound energy. The Diffusor also acts as a diaphragmatic mid–bass absorber and includes a built–in mass–loaded vinyl (MLV) membrane low–bass trap. It solves the two biggest acoustical issues — diffusing mid–to–high frequencies and controlling low frequencies. 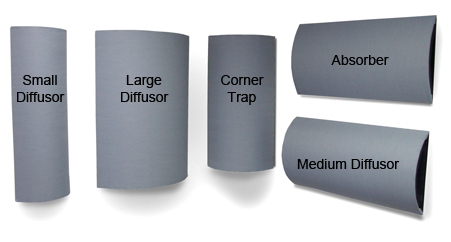 The Advanced Diffusor / Absorber is unique, offering two complete solutions for the price of one product. Three stock Diffusor widths integrate perfectly with two matching models, The Absorber (mid-to-high frequency absorption) and the Corner Trap (an Diffusor with an additional corner bass trap). The right combination and placement of System components will optimize your acoustic spaces, and because of their coherent design, all System models look great together. 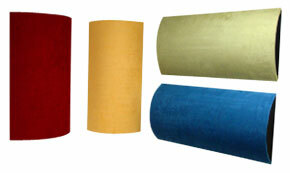 All with MLV membrane - absorbs40-200Hz, diffuses 200Hz-20kHz. All 42" in height; custom heights available. After a century of acoustical research, it's widely agreed that rooms with the right balance of diffusion and absorption are far more natural-sounding and source-accurate than rooms without proper diffusion or with too much absorption. The System was created with a simple, accurate, and affordable way to achieve natural-sounding acoustics. The core of the System is an innovative Diffusor, an improved version of the classic studios since the 1930's. These have proved to minimize flat–surface reflection problems by broadly and evenly scattering sound energy. The Diffusor also acts as a diaphragmatic mid–bass absorber and includes a built–in mass–loaded vinyl (MLV) membrane low–bass trap. It solves the two biggest acoustical issues — diffusing mid–to–high frequencies and controlling low frequencies. The Diffusor is unique, offering two complete solutions for the price of one product. 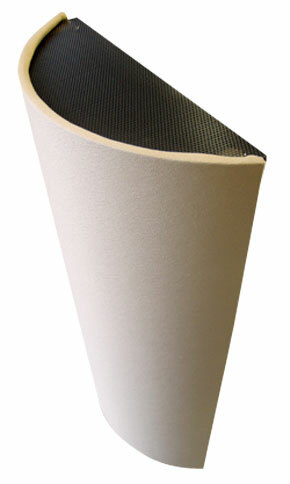 The On-Wall Diffusor/Absorber Panel is a cylindrical diffusor specifically designed to enhance the sound quality and imaging of both mid and high frequencies, in addition to improving dialog intelligibility in home theaters, conference and meeting rooms, voice-over booths and recording studios. 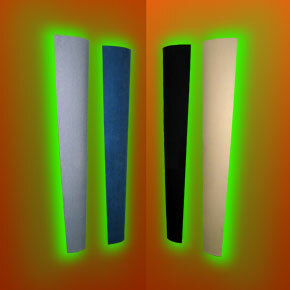 It features an asymmetric (tapered) vertical profile for diffusing critical voice articulation frequencies, 'green' recycled cotton sound absorption backfill, and two-point mounting brackets for easy wall and ceiling placement. Superb front speaker imaging for 2-channel audiophile systems and home theaters. Many fabric choices available (shown: gray, blue, black, tan) - see below for swatches, plus custom wood veneers also available. only 2 French cleats needed for each unit. and for a shipping estimate. Diffuses mid–to–high frequencies, proved to minimize flat–surface reflection problems by broadly and evenly scattering sound energy. It can be a Bass Trap! It can be manufactured to include a built–in Mass–Loaded Vinyl (MLV) membrane low–bass trap for superb bass performance (corner placement required). send a wood sample to match.